LEGO Friends Andrea's Speedboat Transporter is the coolest way to cruise the Heartlake coastline by land or sea. The sporty beach car has a trailer and rope for towing, and the speedboat has steering controls and a turning propeller. Enjoy the party scene with a juice bar, beach area, sun loungers and a barbecue. Includes 2 mini-doll figures and a turtle figure. 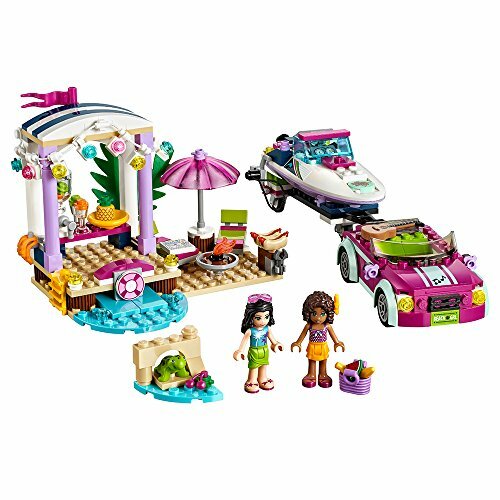 Build Andrea's Speedboat Transporter, complete with speedboat with turning propeller, beach car with trailer, and party scene with juice bar, two sun loungers, barbecue and more!